With the aid of a direct projective approach, a general transformation solution for the nonautonomous nonlinear Schrödinger (NLS) system is derived. Based on certain known exact solutions of the projective equation, some periodic and localized excitations with novel properties are correspondingly revealed by entrancing appropriate system parameters. The integrable constraint conditions for the nonautonomous NLS system derived naturally here are consistent with the compatibility condition via the Painlevé analysis in other literatures. where is the complex wave envelope in a comoving frame, with time-modulated dispersion , nonlinearity , net gain (>0) or loss (<0) , and external harmonic trap potential in BECs, which is usually absent in nonlinear optical transmission aspect . The subscripts x and t denote the spatial and temporal partial derivatives. These coefficients are often assumed to be real. In the contexts of many physical fields, the BECs and nonlinear optics provide excellent proving grounds for exploring nonlinear systems with distributed coefficients. It has been reported that specific dependencies of the equation coefficients on time variables can enhance the stabilities of the solutions [5,6]. Moreover, timemodulated nonlinearities and/or dispersions can facilitate the manipulation of the soliton behaviors. These facts have greatly enlarged our knowledge on nonlinear excitations and given an origin to some important concepts such as nonautonomous soliton , and Feschbach resonance, which has been used to control some nonlinearities of matter waves by manipulating the scattering length either in time or space, and have led to certain proposals of many novel nonlinear phenomena. Dispersion management (DM) for BBCs has also proposed recently and has induced plenty of consequent studies. In nonlinear optics, nonlinear management (NM) and DM are also both used for experiments and theories with temporal or spatial optical solitons, soliton lasers, ultrafast soliton switches . Furthermore, some recent progresses on inhomogeneous nonlinear media have generated novel concepts such as the optical similariton . However, the nonautonomous NLS system (1) and/or its similar versions are very difficult to be solved because of the presence of the time-dependent dispersion, nonlinear interaction managements and external potential. Up to now, a general exact solution to the nonautonomous NLS system (1) has been rarely found although the knowledge of such exact solutions is very valuable for various purposes. Certainly, some special exact solutions have been obtained by the Lax par method , the similarity transformation  and so on. In the short note, we try to give a general exact solution to the nonautonomous NLS system via a selfsimilarity projective approach (SPA), which can convert all exact solutions of selfsimilar well-known models to corresponding solutions of the nonautonomous NLS system. In the following section, we first briefly describe the projective approach. In Section 3, a general exact solution to the nonautonomous NLS system will be derived via the SPA. A brief summary and discussion is given in the last section. where are constants to be determined and N is fixed by balancing the linear term of the highest order with the nonlinear term in Equation (2). If we suppose , and or respectively, then the corresponding approaches are usually called the tanh-function method, the sech-function method and the Jacobian-function method. Although the Jacobian elliptic function method is more improved than the tanh-function method and the sech-function method, the repeated calculations are often tedious since the different function should be treated in a repeated way. The idea of deformation projective approach is that, is not assumed to be a specific function, such as tanh, sech, sn and cn, etc., but a solution of the projective equation, such as the Riccati equation , ( is a constant and the prime denotes differentiation with respect to ), the cubic nonlinear KG equation , (here c, and are all arbitrary constants), or the Jacobian elliptic equation. Using the projective relation (3) and the solutions of the related projective equations, one can obtain many explicit and exact travelling wave solutions of system (2). Along with this line, some scholars further assume that the projective function is an exact excitation of the generalized Jacobian elliptic equation where are all arbitrary constants. Because the generalized Jacobian elliptic equation possesses more exact solutions , one may derive more travelling wave solutions of system (2) than previous ones. where , are arbitrary functions to be determined, is a solution of the Riccati equation or the generalized Jacobian elliptic equation. N is also determined by balancing the highest nonlinear terms and the highest-order partial terms in the given nonlinear system. Substituting the ansatz (4) together with the related projective equations into Equation (2), collecting coefficients of polynomials of , then setting each coefficient to zero, yields a set of partial differential equations concerning and . Solving the system of partial differential equations to obtain and , substituting the derived results and the solutions of the related projective equations into Equation (4), one can derive many exact solutions to the given nonlinear system. Motivated by the above ideas, one may assume a selfsimilar family model as the projective equation, which has been extensively studied in other literature [18,19]. For instant, when discussing a nonautonomous Korteweg-de Vries (KdV) system, we may use the classical (1 + 1)- dimensional KdV equation as a projective equation since the autonomous KdV equation has been widely explored. In the following part of the paper, the (1 + 1)-dimensional nonautonomous NLS system is selected to illustrate the selfsimilarity projective approach, and a general exact solution to the nonautonomous NLS system is derived, which can convert all exact solutions of self-similar well-known standard nonlinear Schröding equation to the corresponding exact solutions of the nonautonomous NLS system. For more detailed information, one may refer to a review in reference . Actually, in (1 + 1) dimensions, it has been proven when a physical system can be expressed by a partial differential equation, then under some suitable approximations, one can always find nonlinear Schrödinger type equation [21,22]. This is why the (1 + 1)-dimensional nonlinear Schrödinger system can be successfully used in almost all the physical branches. which is just the completely integrable compatibility condition via the Painlevé analysis [4,7], i.e., a subtle balance condition to keep the nonautonomous NLS system integrable. Firstly, as a special situation, if , and , i.e., in Equation (26), the nonautonomous NLS system (1) has the canonical soliton solutions regardless of the explicit form of the timedependent nonlinearity and dispersion. This is because in this case the the constraint condition is identified and the scale factor is a constant . 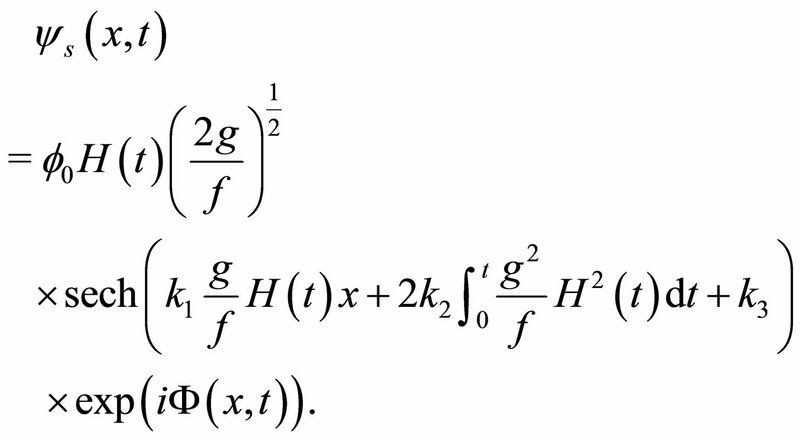 In this sense the soliton solution of Equation (1) is a fundamental canonical soliton. While , i.e., in Equation (26), the original balance between nonlinearity and dispersion is broken down. In the case the canonical soliton must deform itself to build new balance between nonlinearity and dispersion, and the soliton-like solution of Equation (1) is a deformed canonical soliton or a similariton due to the amplitude of the soliton scaled by the factor . And it actually means that if and , the exact solitons of the nonautonomous NLS system (1) are quasi-canonical or deformed solitons depending on if is equal to or not as mentioned above. then we can rederive fundamental canonical solitons, which distinctly indicates the influence of the dispersion, nonlinear managements and net gain to the localized excitation behaviors. Finally, it is also interesting to mention that the external trap potential is absent in the selfsimilarity projective transformations (13)-(16). However, the presence of the potential affects the balance between nonlinearity, dispersion and net gain via the constraint condition (18), and builds a deep relation between the optical solitons and the matter-waves. In summary, the direct self-similarity projective approach is successfully applied to the nonautonomous nonlinear Schrödinger system. In terms of the known exact solutions of the self-similarity projective equation, i.e., the standard nonlinear Schröding equation, some significant types of localized excitations with novel properties are correspondingly revealed by entrancing appropriate system parameters. The present analysis can be applied to all exact solutions of the nonautonomous nonlinear Schrödinger system. The self-similarity projective approach provides an effective and a systematical way to investigate the nonlinear dynamics of the nonautonomous nonlinear Schrödinger system. By the way, as a comparison it is helpful to mention some techniques to find the localized excitation solutions of the nonautonomous NLS equation in previous literature. The Lax pair analysis is very useful in discussing integrability conditions. And a widely used approach is the deformation projective method, which introduces some explicit transformation parameters. These parameters are determined by a set of partial differential equations, which in general case are little solved analytically as emphasized in reference . Another similarity transformation reducing the nonautonomous nonlinear Schrödinger equation to a stationary NLS one has also been introduced . Alternatively, by the Lie point symmetry group analysis, the nonautonomous nonlinear Schrödinger system or its similar versions can be classified into different classes and each one can be converted into the corresponding representative equation by some allowed transformations. As a result, some exact solutions of the representative equation can be transformed into the corresponding solutions of the equations in the same class. However, it was also pointed out in  that in most cases it is still difficult to obtain the exact solutions of these representative equations and the integrability of certain representative equations is not clear. Quite different from the above mentioned techniques, the present work builds a direct connection between the nonautonomous NLS equation and its autonomous counterpart, which provides a more systematical way to find exact solutions of the nonautonomous NLS equation. The corresponding transformation formulas are explicit and straightforward. Furthermore, one can naturally derive the integrable constrain condition (18) via the SPA rather than some integrable conditions via Painlevé analysis first in previous discussions. From the control viewpoint, the self-similarity projective approach provides an effective and a powerful way to control the soliton dynamics as mentioned above. In addition, the SPA that we use to solve the nonautonomous nonlinear Schrödinger system will pave the way to new methods for solving high-dimensional partial differential equations. The authors are in debt to Professors Y. M. Liu and J. F. Zhang, Doctors C. Q. Dai and T. T. Jia for their fruitful discussions. The work was supported by the National Natural Science Foundation of China under Grant No.11172181, the Natural Science Foundation of Guangdong Province of China under Grant No. 101512005- 01000008, the Special Foundation of Talent Engineering of Guangdong Province of China, and the Scientific Research Foundation of Key Discipline of Guangdong Shaoguan University. Y. Gao and S. Y. Lou, “Analytical Solitary Wave Solutions to a (3+1)-Dimensional Gross-Pitaevskii Equation with Variable Coefficients,” Communications in Theoretical Physics, Vol. 52, 2009, pp. 1030-1035. H. Y. Wu, J. X. Fei and C. L. Zheng, “Self-Similar Solutions of Variable-Coefficient Cubic-Quintic Nonlinear Schrödinger Equation with an External Potential,” Communications in Theoretical Physics, Vol. 54, 2010, pp. 55-59. J. X. Fei and C. L. Zheng, “Chirped Self-Similar Solutions of a Generalized Nonlinear Schrödinger Equation,” Verlag der Zeitschrift für Naturforschung, Vol. 66, 2011, pp. 1-5. C. Sulem and P. L. Sulem, “The Nonlinear Schrödinger Equation: Self-Focusing and Wave Collapse,” SpringerVerlag, New York, 1991.